A nitrile is an organic chemical that contains a cyano functional group (subunit), CN-, in which the carbon and nitrogen atoms have a triple bond i.e. C≡N-. The general chemical formula of a nitrile is RCN, where R is the organic group. Nitriles can be thought of as organic cyanides, although they are ordinarily much less toxic than simple cyanide salts such as sodium or potassium cyanide (NaCN or KCN). Compounds in which the carbon atom of the CN group is attached to an acyclic hydrocarbon fragment are generally named using the suffix nitrile. Nitriles in which the -CN group can be thought of as having replaced the -COOH group of a corresponding trivially named carboxylic acid are named by removing "ic acid" or "oic acid" and replacing it with onitrile. Nitriles are usually less toxic than cyanide salts, although they may contain some of the latter as impurities. Aliphatic nitriles can be metabolized to the free cyanide ion, making them generally more toxic than arylnitriles which are stable in the body. The cyanide unit occurs in other compounds such as cyanamide (carbodiimide, H2NC≡N), cyanoacetic acid (malonic mononitrile, N≡CH2COOH), potassium ferricyanide (K3[Fe(CN)6]) and potassium ferrocyanide (K4[Fe(CN)6]), however these compounds do not release cyanide and are therefore much less toxic than simple cyanide salts or many nitriles. Nitriles have tremendous industrial importance. For example, through a process called hydrocyanation, HCN reacts with 1,4-butadiene (an alkene) to form adiponitrile (1,4-dicyanobutane, hexanedinitrile, tetramethylene cyanide, NC(CH2)4CN), a chemical precursor to hexamethylene diamine (1,6-diaminohexane, H2N(CH2)6NH2), one of the polymers used to make nylon. The wide range of chemical reactivity for nitriles is what makes them so useful, but this same feature means that they are incompatible with many substances (see MSDS relevance below). 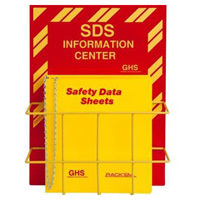 When you work with chemicals, eye washes, safety showers and equipment signs are a must. Get yours at Safety Emporium. This polarity makes nitriles terrific aprotic (no easily ionized hydrogen atom) solvents. For example, acetonitrile is completely miscible with water and methanol as well as organic solvents such as diethyl ether, ethyl acetate, and acetone; at the same time it is virtually insoluble in saturated hydrocarbons. This versatility makes it trivially easily to remove acetonitrile from reaction mixtures without resorting to distillation. Its high dielectric constant (38) and dipole moment (3.9 Debye) make acetonitrile ideal for promoting chemical reactions where ionization is involved, as a solvent for inorganic salts (electrolytes), and as a medium for electrochemical studies. Nitriles usually appear on an MSDS in the context of incompatible materials. In general, nitriles are incompatible with acids, bases, amines, oxiranes, and acid anhydrides. Nitriles can produce other nitriles and highly toxic HCN gas as well as carbon monoxide when burned. You may therefore also see nitriles mentioned as a toxic byproduct of combustion. Although not highly toxic like inorganic cyanides or hydrogen cyanide, nitriles are generally toxic materials and should be used with proper engineering controls and personal protective equipment. As with any hazardous substance, minimize your exposure or potential exposure. Nitrile may also appear on an MSDS as a recommended type of glove, boot, apron or other piece of personal protective equipment. Polymerization of acrylonitrile gives nitrile rubber, a substance with excellent resistance to oils and greases. Nitrile gloves are low cost, have good physical properties, and offer good dexterity. However, they are a poor choice for working with benzene, methylene chloride, trichloroethylene, and many ketones. In this context, the compatibility of the substance with respect to nitrile gaskets, seals or o-rings may also be mentioned. IUPAC nomenclature (naming) rules for nitriles, isocyanides and related compounds courtesy of ACD Labs. MSDS of acetonitrile at Mallinckrodt Baker. Understanding Chemistry: Nitriles dicusses nitriles, as well as their preparation, hydrolysis and reduction at Chemguide. See also: amine, carboxylic acid, cyanide, cyanosis, volatility.